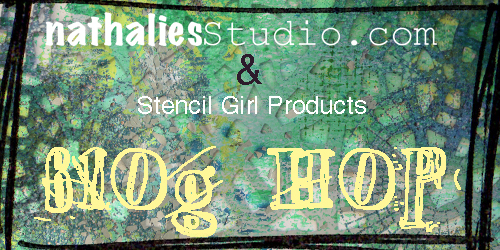 Today I am honored to be in another of Nathalie Kalbach's Stencil Hops with stencils she designed for StencilGirl and it is all about the Crackle! So let's start with an UGLY piece of paper. This paper was where I was cleaning off my brushes, palette knives and brayer. Ugly yes, but wait will will transform it to something beautiful! 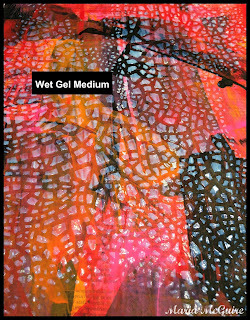 I used Gel Medium with the stencil and allowed it to dry. 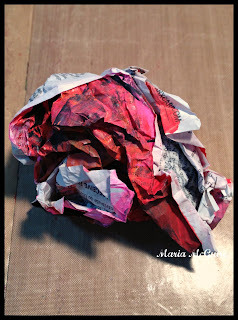 When dry I crumpled it up into a ball, yes I did! Then I put some Rub 'n Buff on my finger and gently swiped across the surface of the paper to bring out all the texture. So what should I make with this beautiful piece of paper? How about a little journal? Start with the cover. 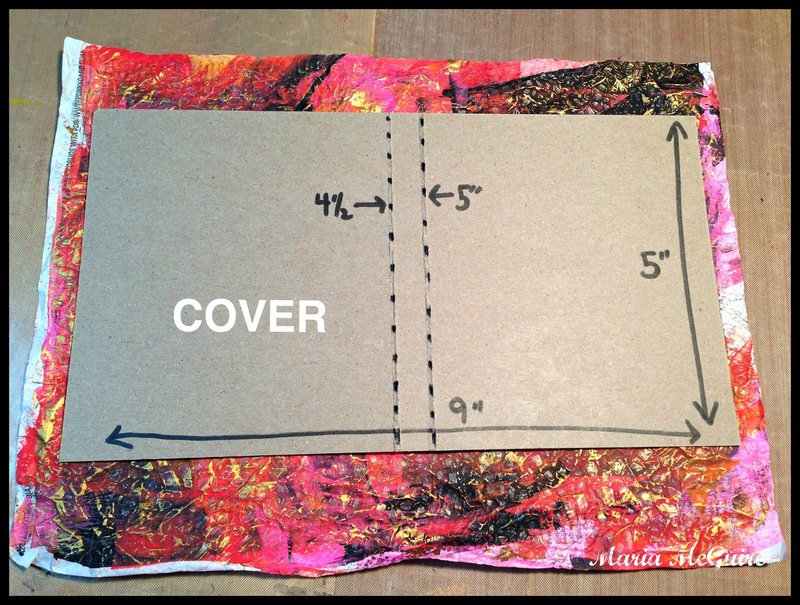 Cut a lightweight cardboard (cereal box weight) to the dimensions shown below. I used a glue stick to adhere the cover to the paper. The inside pages were made with Bristol paper scraps I had using the dimensions below. I made three signatures and each signature had 3 pieces of paper in it. Thanks Nat for having me hop with you! Now it is time for you to go see what the other artists did with the crackle stencil! 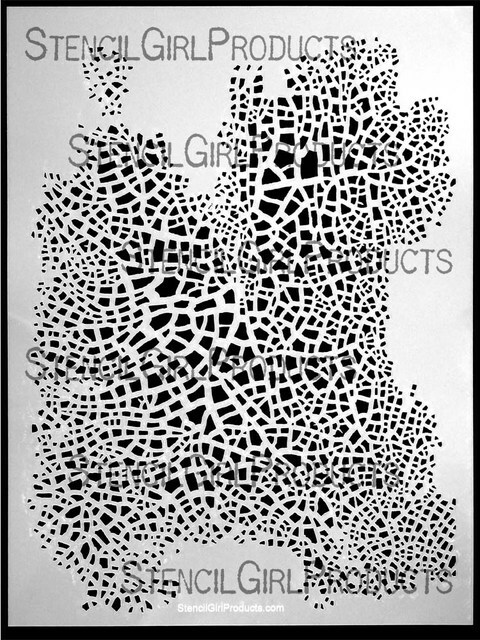 But before you do, make sure you leave a comment here because I hear that Nathalie is giving away a Crackle Stencil to one lucky winner and EVERY comment in the hop will be eligible to win. The more times you comment, the more chances you have to win! Beautiful cover! Love how it turned out with the beautiful patternd and the gold! Thanks for a great tutorial as well! 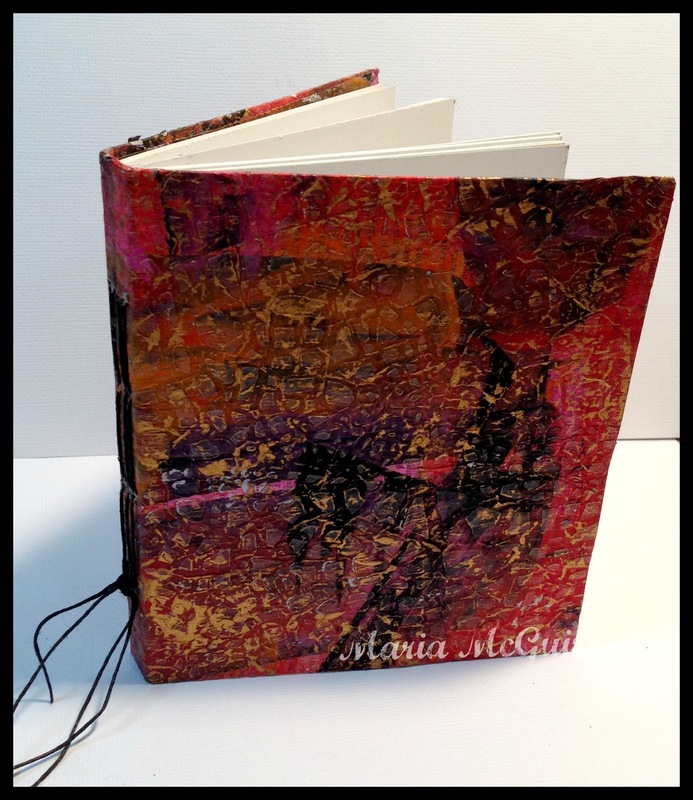 Wooow that is super cool- love the effect with the crumbling and rub and buff afterwards and the book turned out just so cool - love it. Thank you for playing along with me again Maria!!! Huge hugs! I love all the texture. Hi, Maria, This is the true ART of recycling. 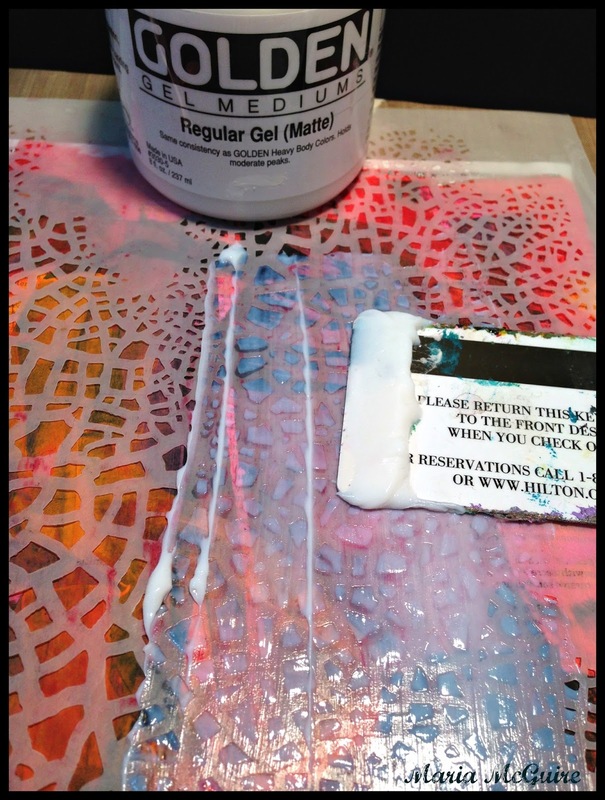 How long did you wait before moving the stencil after applying the gel medium? My impatience gets the best of me. I took it off right away after I scraped it with the card. Drying time varies on how thick you did it and the humidity where you live. I have NO patience so I totally understand. I never clean my stencils when I use paint, BUT when I use a medium like (Gel, Molding Paste, Wood Icing, etc) I always clean it off right away. :) Thanks for visiting! So surprising what you created with the stencil. I love it ! Would love to win a stencil. You really made a beautiful cover for your journal! Thanks for the tutorial! Now that is pretty amazing...take an "ugly" paper and turn it into such a beautiful thing. 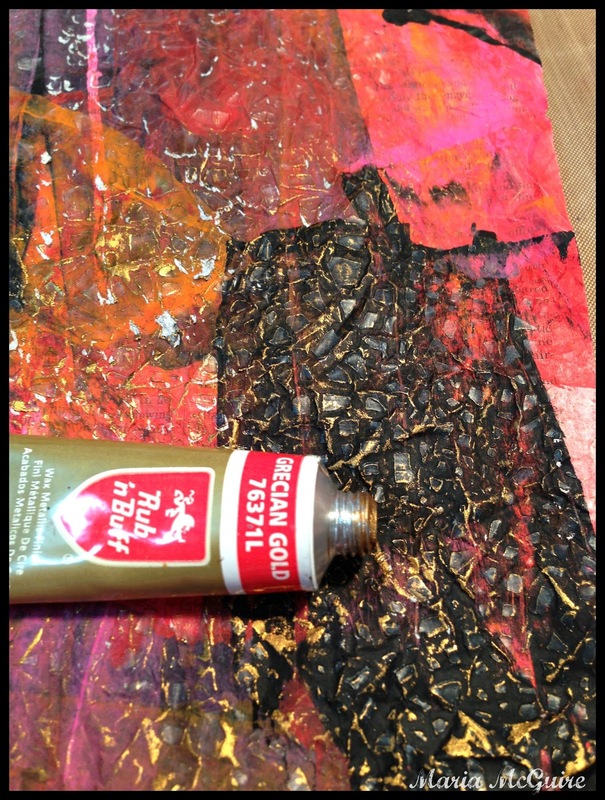 I love how you've taken the stencil and transformed gel medium and a few elements to shiny and colorful wonderful!! Wow1 it's amazing what can be done with a "mop up" page. Thanks for sharing this idea. 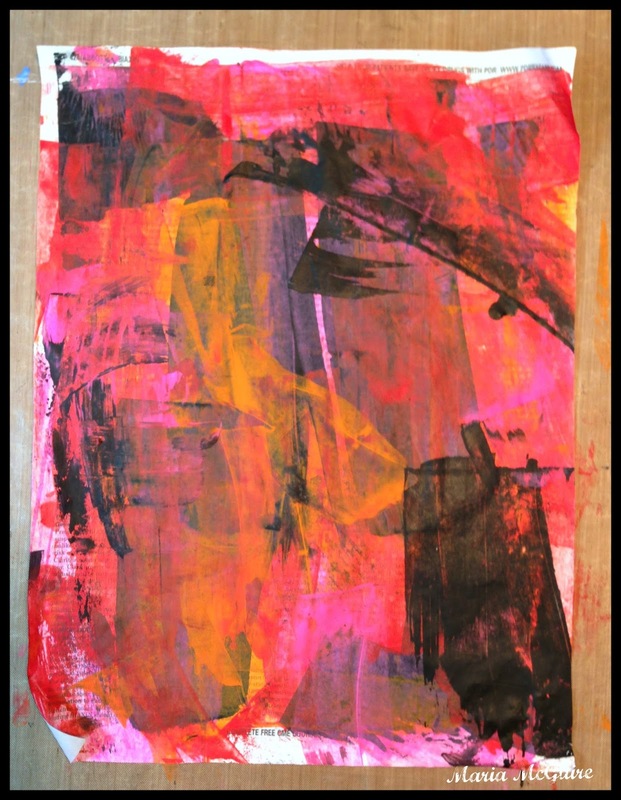 Such rich texture and color! I love love love that you took an "ugly" paper and made it into a stunning journal cover! LOVE LOVE LOVE what you did!!! It's totally amazing how you tansformed that page!! >>> I'm partial to making my own journals too... and yours looks amazing!! marvelous. love the color. love your tutorial. i'm loving small journals these days! Oh wow. Awesome idea. I love everything you do, but this is absolutely beautiful. Thank you for sharing and helping me learn to make a journal cover!!! What a creative way to use this stencil! Oh my gosh! That technique resulted in one beautiful piece of paper and then a journal cover! Gorgeous! Thank you for sharing a technique I would never have guessed how it was done! Oh wow - love the journal cover using Nat's stencil. great idea for all our scrap paper! What a versatile stencil. Love your cover. Wow, I love the transformation! Good grief, that's gorgeous!!! I've got to get this stencil & when I do I just know it's going to be my favourite forever! Fabulous love all the texture and color! No you didn't!!! Yes, you did! How cool is this? And who would've thought you could crumple it up like that and get such a fabulous final result? Awesome. Great project! Love the layering and the use of different materials (including the "star" stencil). Love that you were willing to crumple it up and just see what happened. It turned out great. Thanks. 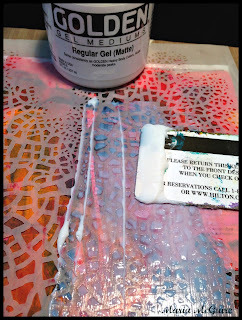 Love the extra dimension of the opalescent sheen in the page using the stencil. What a cool (detailed) project you crafted! Yes you did! Thank you for sharing with us today on a cool way to use the new stencil! Your journal cover is wonderful! Thanks for the great tutorial and so many techniques! Another way for me to use up those tubes of Rub 'n Buff I have accumulated! great idea ! wonderful outcome! GENIUS!!!! And I love rub & buff, so I have to try this out! 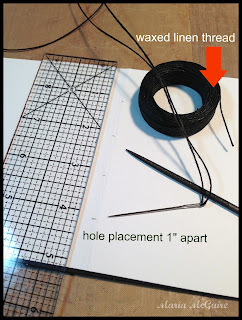 Such an awesome idea...simple, doable even for beginners like me! 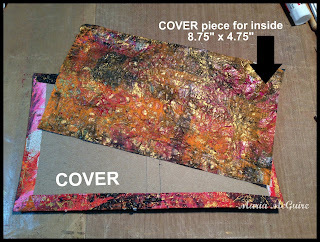 Love how you transformed a 'waste' paper into this lovely cover! There's so much about this project I like. The cover's great and I love how you screwed up the paper. Never heard of buff and rub so will look out for that. And I always love seeing people make journals. Great project! I love how the stencil with rub n buff makes magic over the background. I have several "ugly" papers I can go try it with. And making it into a journal cover is too clever. Thanks for sharing. Wow!!!!!! what a super piece. Your work is great. 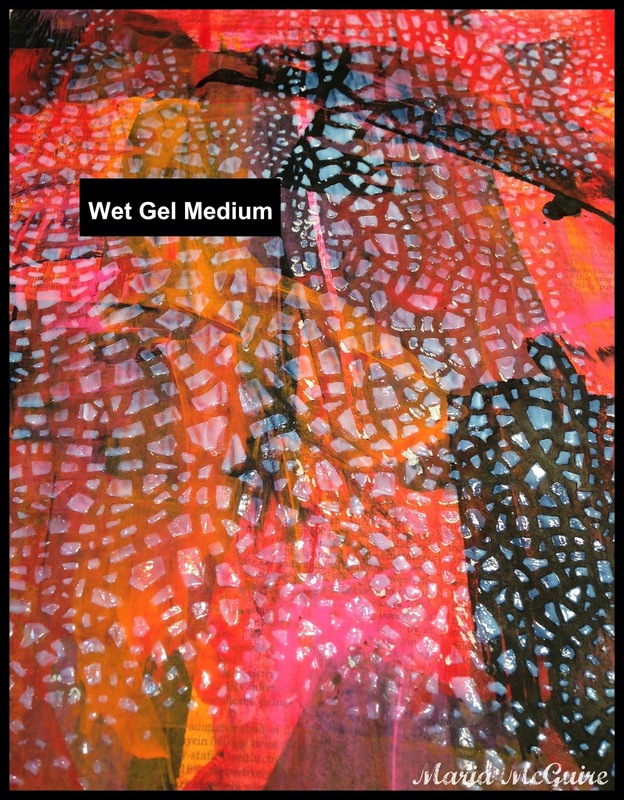 I would love to try this setncil with my Gelli Plate. Isn't it great how there should not be any such thing as ugly paper anymore? Love the idea of making it into a journal. I am VERY interested in how you did this binding! Love it! Hugs! You did! and it turned out great. What a beautiful POP! Fantastic idea!! I have to try this!! Wow gorgeous is that!!! Brilliant work! I really like getting new and unique techniques from blog hops. Yours is something I will definitely try. Beauty from "ugly" Great! wonderful transformation! love the added touch of gold texture! Nice colors for this journal cover. Crumpling the paper was brave and looks fantastic! 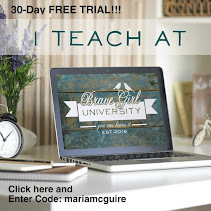 luv your technique - can't wait to try it! Clearly, there is no ugly paper in your house! Great transformation. If you do this with brown paper bag and shoe polish, it cones out looking like leather. Beautiful. What a stencil, huh? Oh Maria, This turned out beautiful! Great directions. I have not made this style of book before. Love ya! 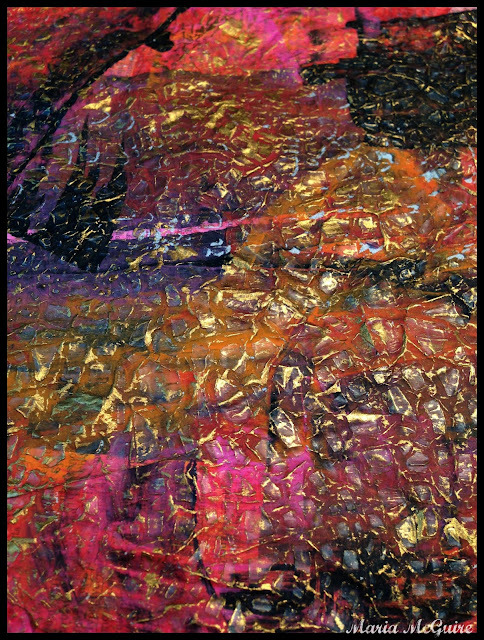 WOW, the colors and texture using the crackle stencil is fabulous! Hope I get to try this technique soon with Nathalie's new stencils. Oh my goodness, I'm never throwing anything again! Great re-purposing! I'm going to try your technique on the next paper I get ready to throw away! Your journal came out great! Love the grungy look! Love this. This technique is so versatile. 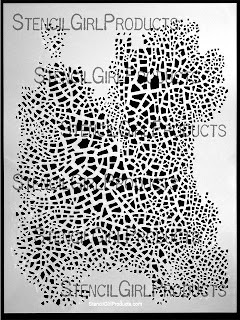 The crackle stencil is absolutely wonderful. I really liked this tutorial. There muchs ideas to try. lovely variation on the use of the stencil. Now that's thinking outside of the box -love it! great project!Love the use of the stencil! 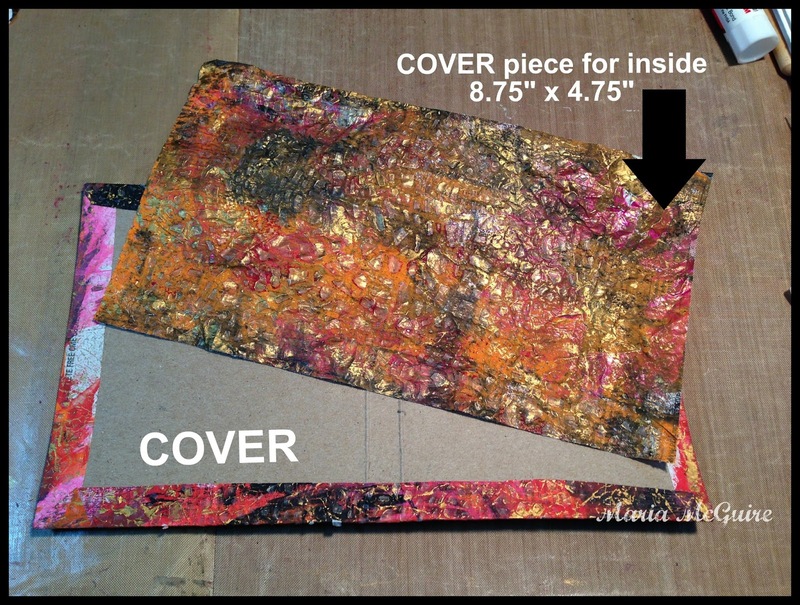 Thanks for sharing how you used the crackle stencil to make the book cover and then for the tutorial on creating the book. I love it! I just love doing things like that with paper (although it's been a very long time since I did)!!!!!!!!!!!!!!!!!!!!!! Gorgeous!!!!!!!!!!!! Gotta get me that stencil!!!! WOw. I absolutely love your cover! 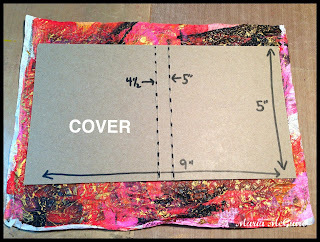 Great idea for using the texture from this stencil, not to mention paint scrap paper. I'm always amazed at the different things people do with the same supplies. Love your book cover. I'm definitely inspired to try using more texture with stencils. Thanks for sharing and thanks for the give-away! Fantastic project and beautiful outcome! Great art work! Thanks for sharing! Love your project and the way you used up the messy paper-so creative, and you've showcased Nathalie's stencil beautifully! Great idea for reusing. thanks for sharing your art and this project...very creative...and your take on this new stencil (a must have)! Your book is lovely!! Thanks for the chance to win this stencil!! Fabulous! I love your journal cover - I 'd love to see how you make them!!! 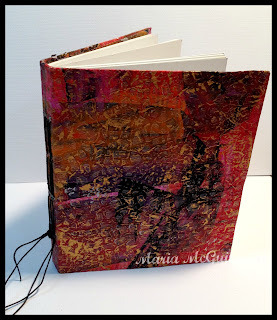 This has been a very inspiring hop....love the texture on your journal that you created with Nat's stencil....Amazing!! My mouth is still hanging open. What a fabulous project and use of this stencil! Thanks for sharing!! 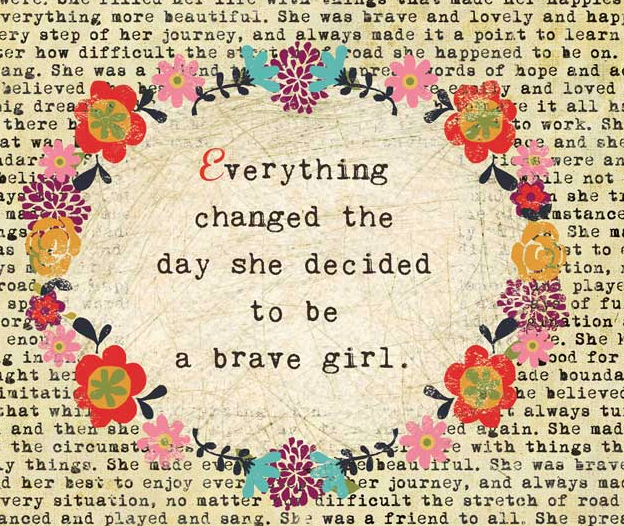 Maria, you are so inspiring! I clean my brushes, etc. the same way! I love the paper that is created in the process. I use mine to make handmade flowers. I love how you used yours! Who knew an ugly duckling piece of paper could be turned into a beautiful swan journal...I love it. Just subscribed to your blog for more inspiration. I can hardly believe how you transformed that paper. Clever you. Love the versatility of that stencil! Do you have to seal the paper when you are done or just leave it as is? I didn't seal it Erica :) I don't think it needs it. Thanks for visiting. Love this little journal. I liked the way you used the stencil. Thanks for sharing your process. I'm a keeper and have a stack of uglies to try this with! I have never made a journal--you make it look so easy. It's beautiful and a very creative use of Hat's great stencil. 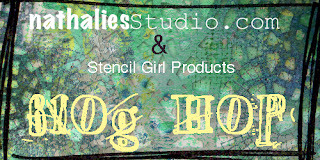 I love that each of you participating in this blog hop have done something so unique which is a testament to the versatility of this stencil. it is on my must have list!! I'd love to win it but if not, I will definitely placer an order for it. 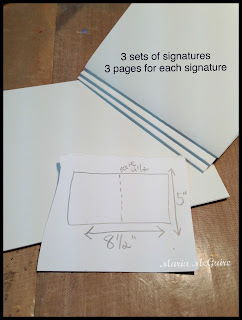 I have made journal covers in the past but never thought about using a stencil to make my paper. Wonderful idea and the gold accents really bring out the stencil. Thanks!! Wow you totally transformed that paper into a piece of art. I'm impressed that you make your own books. I'm a lazy crafter so will have to admit that I would never do that. Which makes me even more impressed lol. Great technique. Thanks for the ideas!